Actinorhytis calapparia (Blume) H.Wendl. & Drude ex Scheff. INDONESIA: Jambe sinagar, Jawar, Pinang kalapa. MALAYSIA: Pinang penawar, Pinang kelapa. 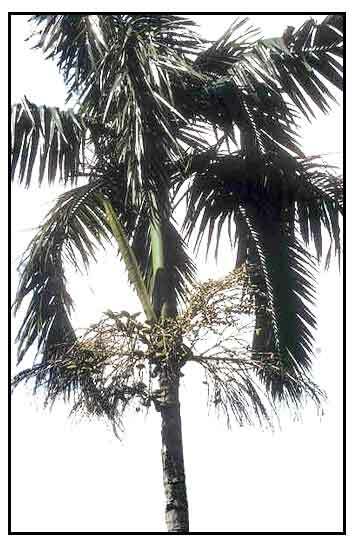 Calappa is a large palm with erect stems, much like the habit of the tall Areca catechu, about 10 meters high. Leaves are pinnate, the blade measuring 70 to 90 centimeters long; the pinnae are linear, 50 to 60 centimeters long, 3 to 4 centimeters wide. Spadix is ascending with 2 spathes. Male flowers are small with imbricate sepals, much shorter than the valvate corolla. Sepals and petals of the female flowers are imbricate. Fruiting spadix is spreading. Fruits are orange-yellow, pendulous ovoid, the size of a duck's egg and containing one seed. - Isolated trees in settled areas, at altitudes of about 500 meters, in Davao (MIndanao). - Widely distributed in the Malay Archipelago. - Phytochemical screening yielded tannins, steroids, carbohydrates and amino acids. - Study of fruit has suggested antioxidant property. - Ripe nut is medicinal, chewed by the Malays as betel substitute. - Fruit used in a lotion to treat scurf. Powdered seeds used as baby powder. - In Sumatra, used for scurf. - Protective: Widely cultivated in Southeast Asia and Malesia where villagers attribute it with magical protective or medicinal powers. Fruit carried in person for protection. - Betel substitute: Kernel chewed as betel substitute. • Antioxidant: Study of aqueous and methanolic fruit extracts showed dose-dependent antioxidant activity using DPPH and ferric reducing model assays. The total phenolic content were 56 and 64.3 mg/g equivalent of gallic acid, respectively.